In a recent update, Island Ferries says it has made enough progress on its negotiations with the Port of Vancouver and TransLink. This has set a potential launch date of Summer 2019 for its high-speed commuter passenger ferry service between downtown Nanaimo and a berth at the SeaBus terminal at Waterfront Station in downtown Vancouver. The “costly and complex” undertaking involves the order of two new high-speed catamaran ships, which are currently being built in Singapore at a cost of $40 million. The first vessel is anticipated to be ready for sea trials in late spring, and the second ship will likely follow in early summer. Negotiations with TransLink for the private ferry service’s use of the SeaBus terminal are “well-advanced” to the extent that construction to replace the external structures at the terminal could begin early this year. Over on the route’s other end, Island Ferries is “ready to go” apart from finalizing the lease for the space it requires for a terminal. All of the terms have been agreed to by both parties. Unlike other local catamaran ferry operations, this new Vancouver-Nanaimo ferry service is intended to be an affordable commuter ferry option. Multiple trips will be made daily between both cities, with each one-way trip boasting a travel time of just 68 minutes and a starting fare of only about $25. In contrast, the BC Ferries crossing time from West Vancouver to Nanaimo is 100 minutes – and that does not even include the driving time to and from the Horseshoe Bay terminal. 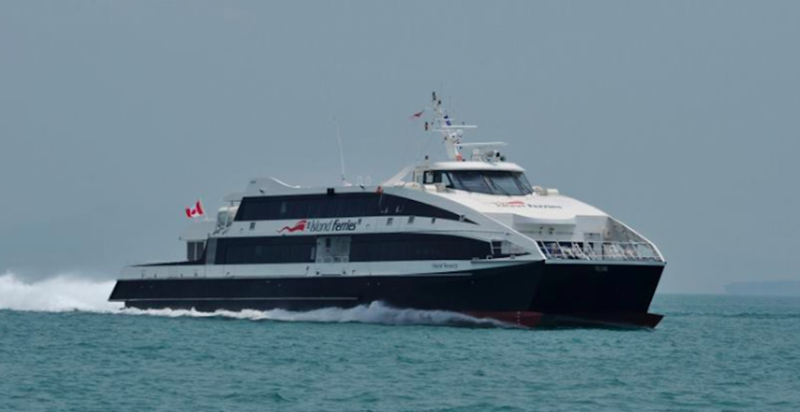 Each Island Ferries vessel will have a capacity of 376 passengers and a maximum speed of 40 knots (75 km/h). The acquisition of two vessels also provides the service with a backup vessel and ensures the continuation of service, unlike the failed Harbour Lynx service which went bankrupt in 2006 when its single 300-person capacity catamaran vessel suffered a fatal engine failure.